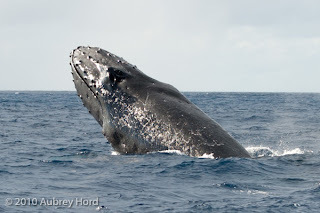 The Humpback Whales are back in Hawaii for the 2010-2011 season and happily playing in the waters between Maui, Lanai and Molokai, called the Au Au Channel. They come down to Hawaii from Alaska every season (Dec-May) to give birth to calves and breed before returning to their feeding grounds in Alaska. We were fortunate on Christmas Day to be out on the water watching a competitive group of 7 whales who treated us to breaches out of the water, pec slaps and head lunges. It was fantastic. We got caught in several heavy squalls of rain which made it pretty challenging to shoot but I was able to get a few shots in between.